How improv comedy skills became a must-have for entrepreneurs. Photo illustration by Lisa Larson-Walker. Photos by Thinkstock or courtesy of Flickr Creative Commons. A few years ago, for complex reasons, I attended the orientation week for Columbia Business School students. The week involved team-building exercises that forced us to solve problems together. It included a module on ethics, in which we were asked to respond to hypothetical dilemmas. There was, of course, a near-lethal amount of alcohol consumption. And, one morning, as we gathered (quite hung over) in the auditorium, we did improv. Improvisational comedy workshops have become a staple at business schools, and in the corporate world in general. Bob Kulhan, co-founder of Business Improvisations, helped originate the trend. In 2000, drawing on his experience performing on the Chicago sketch comedy scene, Kulhan partnered with a professor at Duke’s Fuqua School of Business to launch an improv training program tailored to MBA students. The program expanded to the business schools at UCLA, Columbia, and Indiana, among other universities. At first glance, zany improv and the straight-laced corporate world might seem to be unlikely bedfellows. But the cross-pollination between comedy and business has led both to fruitful managerial skills development for executives and to fruitful employment for funny folks. Comedians have not only led training workshops, but have begun to infiltrate marketing departments and advertising agencies. They have even, in at least one case, put their stamp on an entire workplace culture. That’s an important lesson in any business setting that demands cooperation and innovation. Improv also requires excellent listening skills, rewards those who shed their inhibitions and leap into the middle of the group dynamic, and offers valuable lessons about the wisdom of shrugging off setbacks. Harding says demand for workshops is growing. 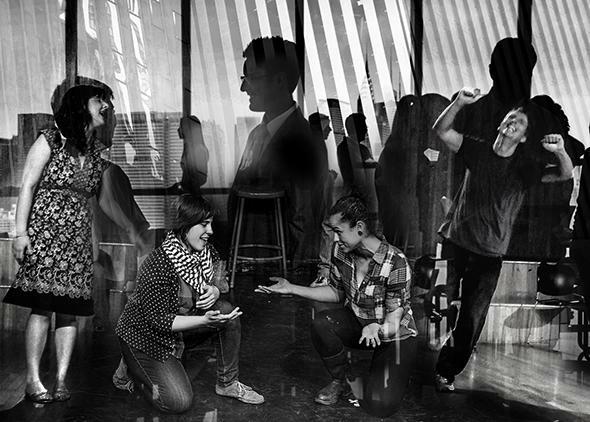 Improv Asylum has been running regular programs for employees of Twitter’s Boston campus and has also worked with Google, Fidelity, Raytheon, and Harvard Business School. Its latest venture is an international expansion, with a new Improv Asylum theater and corporate training group based in Dublin to offer workshops for the many multinationals headquartered there. Harding has already worked with European-based companies including Jägermeister, Carl Zeiss, and Nokia. Harding’s background is in advertising; he worked first at the Leo Burnett agency in Chicago (where he took improv classes in his spare time) and later as the advertising director for Polaroid. Which suggests another natural intersection point for comedy and business. Harding says that Improv Asylum has lately been creating a series of online ads for Dunkin’ Donuts, collaborating with Boston ad agency Hill Holliday on scripts, casting, and production. According to Nate Dern of Upright Citizens Brigade, the legendary New York improv group, advertising and PR firms frequently hire UCB for “punch-up” sessions, to inject more humor into a pitch for a client or an idea for a campaign. At least a couple of UCB performers maintain day jobs as creatives at advertising firms. And sometimes UCB will actually deliver the end product, as in a series of Web videos for the fast food chain Arby’s. Current Groupon employees say the stunts have since been toned down. Perhaps there are limits, after all, to the confluence of comedy and corporate world. It turns out that unfunny is still unfunny, whether it’s on a stage or it’s walking past your cubicle.